On February 11, 2019, The New Yorker released a long-form article documenting the numerous and inexhaustible lies told by bestselling author Dan Mallory (writing as A.J. Finn). This is the story of how I fell for his lies, and how I took them personally. No story in my life right now can be told without context: my daughter is sick. Not dangerously so as it turns out, thank goodness, but it took a solid month to find the right diagnosis. If you have children in your life, I'm sure you can imagine that terrifying first month: she was ill, alarmingly so at times, gasping for air between coughs that left her body shaking. Exhausted and listless, her eyes were ringed in black, her cheeks pale and thin. I tried to stay calm day after day, doctor visit after doctor visit. By week three, however, I was losing my cool. She was on steroids that made her emotional, inhalers and breathing treatments that hopped her up, and cough syrups that made her gag. Still: she coughed and coughed and coughed. Plus we had no diagnosis. Was it asthma? Reflux? Some kind of psychological tic? My mind went to cancer, of course, and terrifying nightmares of losing her. My baby was sick, and no one could tell me why. He was unflappable. Handsome. Sweet. Self-deprecating. Everything a best-selling author should be. Monday, February 11, found us at a hospital for bloodwork and a nasal swab. Just us two in the waiting room, alone together. The lighting was grim and institutional; I was on empty. My daughter was semi-happily distracted with a Percy Jackson novel, so I pulled out my phone and opened Twitter, seeking an escape. A headline caught my eye: "A Suspense Novelist's Trail of Deceptions." The thumbnail image was catchy, too: a stylized man with short hair and a scruffy chin. I knew who it was before I opened the article. Damn, I thought. Not him. Not now. A bit of background here: for the past two years I've worked for a private membership library and a literary festival in Charleston, South Carolina. We host authors regularly. I've met David McCullough. Colson Whitehead. Tina Brown. Jeanette Winterson. And many others. I'm friendly by nature, and I tend to let people into my world. I fall in love (platonically speaking) a lot. If you're a speaker at my literary festival, chances are I'll consider you my friend long before you arrive in Charleston. Last February, my colleagues and I began preparing for a banner month in March. A.J. Finn was one of many, but his event promised to be a doozy. As I prepped my own media and press releases, I read all about Finn and his debut thriller, The Woman in the Window. Everything I read was positive. Glowing. He was my age, a successful editor, a bestselling author. By the day of his event, I was nearing giddy. His talk was a sellout, so we staff spent the day arranging chairs and stages, making sure our AV equipment was functional. By the time he arrived with his mother—early, to pre-sign books, if I remember correctly—I was already exhausted. But there he was, handsome and grinning. I crossed the room to shake his hand, wondering if I should hug him instead. He's that kind of guy. Soon we were laughing together as I told him about the library and took him on a brief tour. There was nothing about our encounter that was alarming. He was charming. I blushed. He left to rest before his event and I'm not going to lie: I swooned a little in his wake. The evening was a rousing success. A.J./Dan (he answered to both with ease) was great in front of the crowd. He simpered. He preened. He spoke of his struggle with mental illness and his bipolar diagnosis. He mentioned a new cocktail of drugs that made him feel sane again. The crowd was sympathetic. Supportive. Here was a man rising above the cards life dealt him. He spoke of his love of Hitchcock movies and mysteries, and how his career as an editor taught him the formula for writing a successful novel. He spoke of the choices made along his journey. A.J. Finn is his pen name because it's easy to pronounce. Short chapters keep readers turning pages. 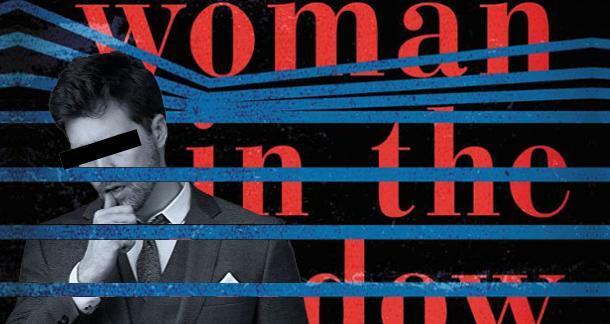 He called his book The WOMAN in the Window because he was tired of women being called girls. We all felt proud. Here was a man taking the formula and making it his own. The line for his post-talk signing was extensive; nearly everyone in the room waited for the chance to shake his hand. I bought his book and waited for him to sign it. It was late by the time the event wrapped up. I'd be lying, though, if I said I didn't stay later than I had to, just for another chance to chat with A.J. Finn. Before he left, he gave me a giant hug, as genuine and kind as a new best friend. The next morning, he showed up with flowers for the library's director and me. A simple token, a thank you for our support. I swooned. Again and again. For months after, library patrons would pull me aside. "Remember A.J. Finn," they'd say. "Wasn't he amazing?" Flash back forward. February 11, 2019. Me, in a hospital waiting room with my daughter, reading through Dan Mallory's web of lies. There was the story of his dead mother that he used to get into the New College at Oxford. She's not dead. I met her. For god's sake, don't leave pee in a cup outside your workplace restroom! There was the story of his own faked illnesses. Cancer. Brain surgery. As a mother who was then worrying her child had cancer, that was blasphemy. Elsewhere in his stories his brother died, though in reality he didn't. There were numerous tales of manipulations via email, and maybe even pee left in a cup outside his employer's restroom. Each story felt like an accusation directed at me: I'd believed him. I was an idiot. Every new detail made me feel worse. How could you fall for this, Leah? What were you thinking? How could you not see it? Maybe it was because I was in a vulnerable place already, but the article eclipsed my daughter for a time. She had blood drawn and I barely noticed, then a swab shoved so far up her nose I thought they might be mummifying her. I was a terrible parent just then; I was far too busy judging myself to be able to comfort her. How could I have fallen for it? Dan Mallory isn't a criminal. Nothing he's done crosses the line into dangerous. It's just inappropriate and creepy. His lies had absolutely nothing to do with me or my life, but sitting in that hospital that day I felt like they did. As someone who'd met him, who'd believed the things he said, I felt awful. Manipulated. It's an example of how the things you say and do can effect people in ways you can't even imagine. Dan Mallory was nothing but sweet to me personally, but ever since reading the New Yorker piece I've wanted one of those hot, metaphorical showers to wash the metaphorical slime off my metaphorical body. No normal shower can fix me. I fell for the lies told by a person in the spotlight. He calculated every bit of his story to trick people like me into trusting him. Into supporting him. It's a dirty game he played and I fell for it. It hurt me. Dan Mallory didn't care about me, doesn't even know me, but his lies hurt me just the same. So be kind to people. Be gentle. Be as truthful as you can. And for god's sake, don't leave pee in a cup outside your workplace restroom! Hi Leah, so sorry to hear about your daughter, sending thoughts, hope and hugs to you all.